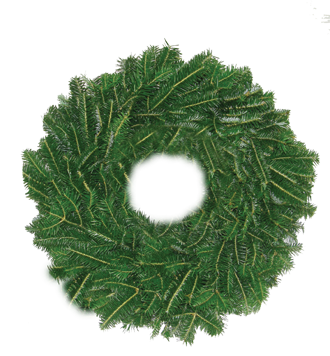 Aside from the traditional Fraser Fir Christmas Tree, the Fraser Fir Christmas Tree Wreath may be the most recognized symbol of the holidays. This traditional medium for crafting Fresh Christmas Wreaths fills the home with the forest-fresh scent of the beloved Fraser Fir. Kathy Shore Nursery offers Fresh Christmas Wreaths made from the boughs of North Carolina Christmas Trees. Handcrafted Fraser Fir Wreaths are how Kathy Shore Nursery got its start and the wreaths made here are unparalleled. Available in all sizes, Kathy Shore Nursery's dedicated workers make each wreath with care in a climate controlled environment. Whether you're looking for a large Fresh Christmas Wreath to hang on your barn or a small wreath to serve as your Advent wreath, Kathy Shore Nursery's Wholesale Christmas Wreaths are perfect for any use. Kathy Shore Nursery's dedication to excellence is sure to impress you and your guests. Call Kathy Shore Nursery today for information on our show-stopping Fresh Christmas Wreaths and our other greenery products. If you're interested in a Christmas Wreath Fundraising Program, Kathy Shore Nursery can help! We also specialize in beautiful North Carolina Christmas Trees and can help you save money by palletizing your order. Call us today!